Raymond Reichwein, M.D., co-director of Penn State Hershey Stroke Center, adds that one of the key elements of the program’s success has been quarterly meetings with the Penn State Hershey program director and coordinator at the ten satellite locations. Participants review both successes and areas for improvement, seeking always to decrease the patients’ time to treatment. Decreasing time to treatment begins in the ambulance. EMTs can currently identify potential stroke patients roughly 78 percent of the time, says Cockroft, and a study scheduled to begin later this year will equip EMTs with iPads to initiate communication with a stroke specialist immediately, and notify the ED. 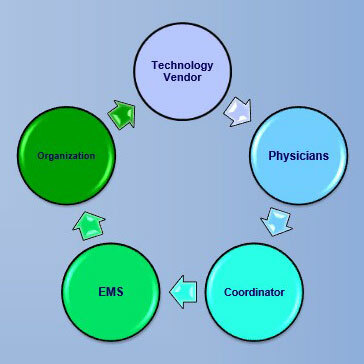 Reichwein notes the positive effect of the telestroke program on partner sites, stating that some partner sites have attained Primary Stroke Center certification as a result of participation in the program while others are no longer bypassed by EMTs seeking to comply with the “stroke-ready hospital” standards. Even though 75 percent of patients remain in their local facilities, advanced neurological care is available around the clock to ensure patients receive rapid, evidence-based treatment in the most appropriate location. Making those judgments quickly and accurately is critical to significantly reducing complications and, in many cases, providing life-saving treatment. Kevin M. Cockroft, M.D., M.Sc., F.A.A.N.S., F.A.C.S., F.A.H.A. Bladin C, Cadilhac D. Effect of Telestroke on Emergent Stroke Care and Stroke Outcomes. Stroke. 2014;45:1876-1880.